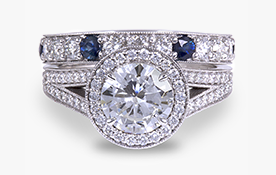 At Diamond Ideals we are experts in creating custom jewelry, whether it be an engagement ring, re-purposing a family heirloom or creating something unique and one-of-a-kind for a momentous occasion. The process may seem daunting but we make the process seamless, personal and collaborative with a few simple steps. 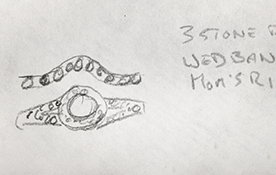 Meet with Laurent to discuss all your ideas for the perfect ring where he will take copious notes, give ideas and sketch out the ring concept. At the end of this meeting, you will have a roadmap for your ring and a budget. 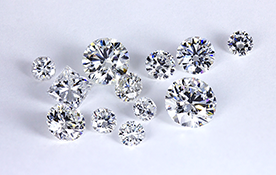 At Diamond Ideals we examine ever stone ourselves to ensure the brilliance and scintillation and we present the top three stones and photos with comparision shots and reflector imagery. If you are unable to visit our showroom to view the stones in person, we are able to do this through video conferencing and email with our in depth photos and knowledge to explain each stone to you. 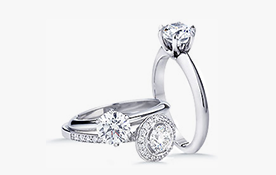 We design the ring envisioned and present it to you. We make all the adjustments until we deliver a drawing that is exactly what the customer dreamed. 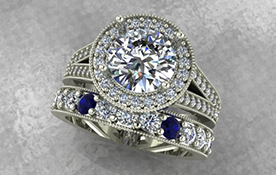 Once the design is approved, we will create your ring or piece of jewelry and deliver to you in a week to 10 days. The end result is personal, unique and exceptional – worthy of being yours.